Our foundation experts will provide you with a free no obligation estimate for the repairs or foundation maintenance your property needs! We have been repairing foundations since 1978 and have pioneered state-of-the-art techniques that revolutionized the industry including the precast concrete pile and tunneling for interior pile placement. Du-West stands behind all of our work with a written guarantee. Our Ultra-Pile and Steel Pile guarantee is for the life of the structure and is transferable to the new owners if you sell the property. Our bell-bottom and drilled pier guarantee is a full five-year, and is transferable should you sell the property. If your property is a Pier and Beam or Block and Base type foundation (those with a crawl space) Du-West will perform repairs with most others will not and provide a 6-month warranty and a 2-year service agreement. While many companies now offer a lifetime warranty remember the warranty is only as good as the company doing the work. If the company providing the warranty goes out of business your warranty is gone. Du-West has been in business for over 40 years. If you need us in the future, we will be here. Du-West is proud to offer our customer excellent financing options allowing for needed repairs to your property now. Our staff will help you secure financing to allow you to get the repairs you need and complete other improvements you want for your home. Doors that are sticking or have large gaps on top. These signs don’t always mean you have a foundation problem, but they are definite signs that you should get a professional evaluation. Du-West foundation experts will identify the source and severity of the issue and prescribe foundation work or just some simple maintenance to resolve the issues. We’ve been keeping Texans on a solid foundation for over 40 years! Our foundation repair services extend to residential and commercial buildings, industrial facilities, bridges, and just about anything that sits on the moving soil. After conducting a thorough evaluation, Du-West’s specialists determine if repairs are necessary, giving you good news when we can. 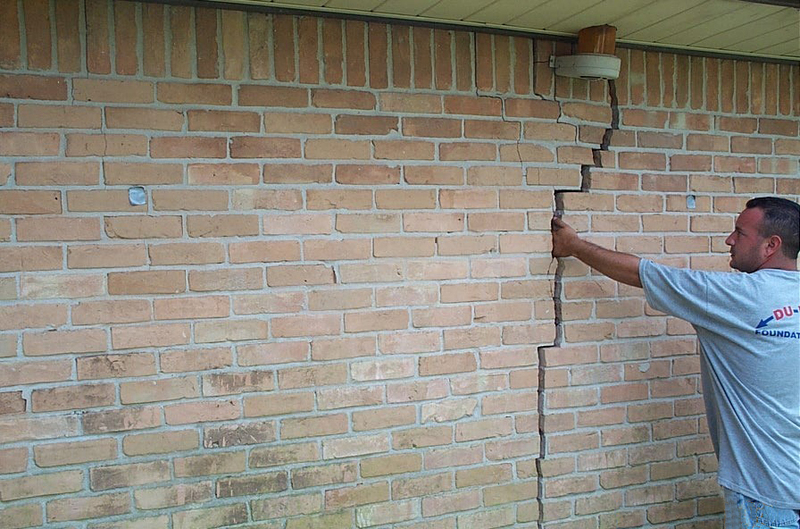 While sticking doors, cracking sheetrock, and brick veneer are sometimes signs of foundation damage, it is important to understand the causes of foundation damage and to conduct a thorough evaluation to assess the actual situation. Expansive soil, thirsty trees, deteriorating or cracking plumbing, drainage issues and lack of foundation watering are known causes of foundation damage. When providing repair or maintenance services Du-West strives to employ efficient, less disruptive methods to address each problem. Du-West offers methods which are convenient, quick, and guaranteed. Our experts will guide you through the process answering any questions you may have. Where applicable repairs are covered by a transferable warranty. Beginning in 1978, Du-West set out to do one thing extraordinarily well: provide the best possible repair solutions to Texans like you. Du-West leads the industry because we’ve developed techniques to revolutionize foundation repair. Today, Du-West continues growing, consistently delivering a repair you can depend on by a company worthy of your trust. Du-West has successfully serviced Texas for over 40 years. In many fields of construction and property maintenance, this experience has provided answers to your questions and concerns about repairs, new installation, and maintenance services. We respect your home and business. The only thing we leave behind is a good experience and quality work. Du-West technicians always wear shoe covers or remove shoes before entering. We provide and use drop cloths on every job and clean up and vacuum upon finishing the work. We bring any trash and debris with us for proper disposal. Du-West employees are easily identified because they wear uniforms. Not only are our trucks marked with signage but our employees wear a photo ID and name tag. Du-West technicians attend mandatory and ongoing training. They are encouraged and rewarded for going above and beyond the achievement of mandatory certification. We also perform background checks and random drug testing. Du-West also follows federal and state immigration laws. Money shouldn’t stand in the way of proper care of your home and now it doesn’t have to. Because Du-West, the same people who revolutionized foundation repair, can now provide you with up to 100% financing with approved credit. That means the out-of-pocket expense doesn’t have to be a reason to put off repairs any longer. With financing from Du-West, you can even go ahead and complete other improvements to your home too. Just as you wouldn’t put off needed medical care, you shouldn’t put off needed care of your home. Get the repairs you need and the improvements you want without the wait with financing from Du-West.